Greetings, fellow Stampers! Today I have an awesome project to share with you. 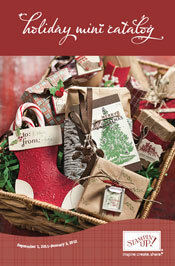 It features the new Stampin' Card Keeper which is offered in the Holiday Mini Catalog. I would love to take credit for this project, but I can't. I completed it at a class offered by my awesome and talented up-line, Terri Brennan. You can visit Terri's blog and see more of her beautiful creations by clicking here. 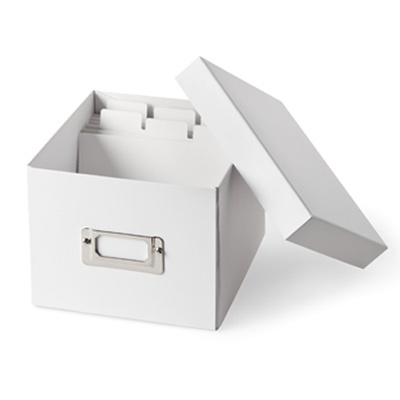 The Card Keeper, after assembly, looks like this. You can use it as-is, or decorate it to the nines, as we did! The fun part about this project is you can use whatever designer paper and accessories you have. The outside of the base is covered with Pool Party Card Stock which was stamped with the En Francais background stamp. The word 'Cards' was stamped with the Winter Post Stamp Set. The lid is covered with Spice Cake Designer Series Paper and embellished with a flower made from Spice Cake Fabric, Card Stock and felt. The scallop ovals were cut with the Big Shot and the Scallop Circle Dies. The fabric layers were scrunched up with starch and dried with the Heat Tool. The Card Keeper comes complete with directions, templates for cutting, and six dividers. We covered our dividers with more DSP and labeled them using the Teeny Tiny Wishes and Petite Pairs Stamp Sets. Now I need to get busy filling my Card Keeper up! The Stampin' Card Keeper, Spice Cake Fabric and Spice Cake Designer Paper are offered for a limited time in the 2011-2012 Holiday Mini Catalog. If you don't have a copy and would like to request one, click here. Hi Sandy, This is just beautiful! I bet it would make a fabulous Christmas gift for someone special. Great job!